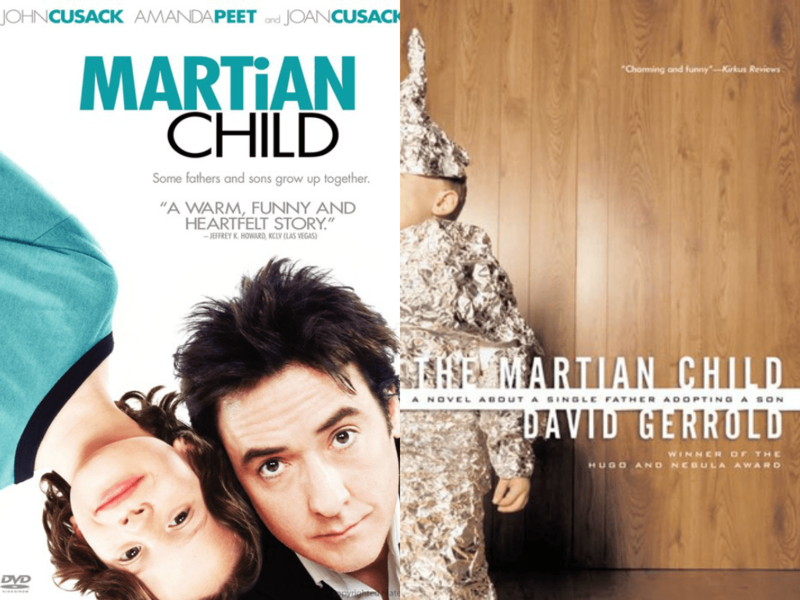 When I saw that this week’s topic for “Awesome Adaptations” (hosted by Picture Me Reading) was “An Awesome Adaptation of Your Choice,” I knew I might as well pick one that was fresh on my mind due to a recent re-watch, Martian Child. The movie, released in 2007, is somewhat based on the novelette (later expanded into a novel) The Martian Child by science fiction author David Gerrold. In the film, David (last name changed to Gordon) has been a widower for two years when he finally has the chance to adopt a child, as he and his wife were trying to do before her death. The child is Dennis, a boy who believes he’s from Mars, a reaction to how alienated he feels and how he copes with having lost his parents. Since I have not read the book, I once again do not know much about the differences between the two, but I do believe that the heart of the story must largely be the same. One thing in the film that stands out to me is the beginning, where David Gordon is being interviewed about his books. He explains how it’s true that authors often times do insert themselves into a character in their story. But for him in one of his books, it’s not who you would expect, because he identifies the most with the creature. This interview sets the tone of the film, of how alike David and Dennis truly are and how much they can learn from loving each other. If you’ve seen Martian Child, what were your thoughts? Or is there a movie you saw recently that was an adaptation of a book? I have watched Martian Child, but I didn’t know it was a book. Interesting. I thought it was cute. The last book to movie movie I watched was Life of Pi, I think. I really liked it, but I still think I liked the book ever so slightly more. Marley and Me is probably my favourite book to movie adaptation, if I had to pick one. But, I must confess, I read the book second, so that can skew things. I think I tend to enjoy whatever I am exposed to first as well, be it the book or the movie. It’s fun to see John Cusack interact with his sister Joan in the movie! You’d probably really like this movie then!